Who doesn’t love finding gold under the rainbow? I’ve joined with a group of bloggers who will be offering great prizes for you, just waiting to be found under the rainbow! So, hop along to all in the giveaway hop linky below to find your gold! 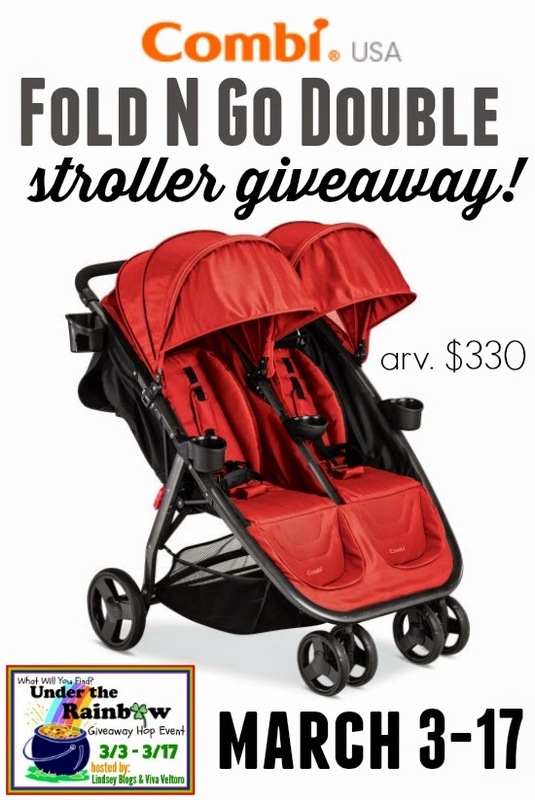 Don't miss the Grand Prize too - if you have 1 or 2 children, you'll find the gold under the rainbow in the form of an amazing Fold N Go Double Stroller from Combi USA! Enter the Grand Prize here. 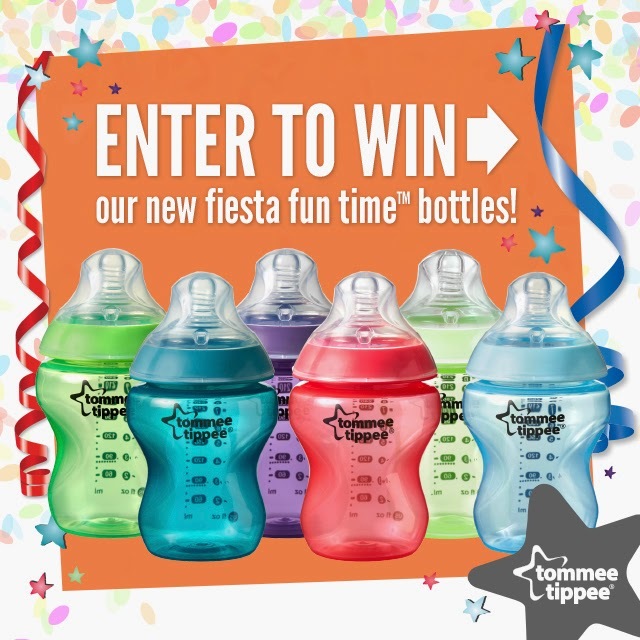 I am excited to share tommee tippee Fiesta Fun Time bottles with all of you! Color is an essential part of how your baby sees the world and now you can introduce an array of color with these specially coordinated packs for boys and girls, making it easy to brighten your day by playing with color. The tommee tippee Closer to Nature Fiesta Fun Time Collection 5-pack Bottles are available for purchase at Amazon.com! But you can win one below! Entry is simple just follow the prompts on the Rafflecopter below. Open to US only, must be 18+ to enter. I love the Tommee Tippee bibs. I also like the Stage 2 Dual Ended Chewther. Thank you! When my daughter was a baby I gave her a Tommee Tippee sippy cup for her first Christmas. I'm happy to see them stateside now. I like the straw transition cups. I love the Tommee Tippe sippy cups! I really like their sippy cups. I think that the sippy cups are really nice! I actually am currently using the Sensitive Tummy Feeding Bottle for my son Jasper. I really love it, its been a lifesaver for us. Those bottles are fun! I like the Glass Feeding Bottle. I like both their sippy cups and the glass bottles! The 360 sealer diaper disposal system sounds great! I would love the 360 sealer Diaper Disposal system! A must have for parents. I like the Stage 1 Chewther b/c my little one needs something to chew on - not me! With my last baby I loved the electric bottle warmer. Easy and convenient to use. All of their toddler feeding stuff is awesome! Thank you! I really like the section plates for toddlers! Love all the fun colors. There are great. I really like the sippy cups. They are great. I have a friend that loves their sippy cups, they look like a great product! I also like the Closer to nature Chewther Keys - blue. I would love to have the Stage 2 Dual Ended Chewther for my niece. I also like the Easy Scoop Feeding Bowls With Lid and Spoon. I like the fun-style-pacifiers . I also love the Truly Spillproof Straw Cups. I like the bright, festive colors. i really like the sippy cups. I've only used the bottles but love them. I would love the 360 sealer Diaper Disposal system! its a great product and very usefull. I have never tried any Tommee Tippee products before but would love to give the Truly Spill Proof Spout Cup a try with my kids! I like the Easy Scoop Feeding Bowls With Lid and Spoon and the Pop Up Storage Cups. I also like the 360° sealer Diaper Disposal System. I like the double electric breast pump. Thanks for the chance. I love their chewthers, the only teething things all of my babies would take! I love their electric bottle warmer! I like the 12 months + insulated sipper cups. I like the 360° sealer™ Diaper Disposal System. I'd love to try the Easi-mat as it seems like a great way to keep plates and bowls in their place and avoid messes! I really like the 12m+ Insulated Straw Tumbers. They have alot of great products. I like their electric breast pump. I like the night time and fun style pacifiers. Another product I would love to try is the Travel Bottle and Food Warmer! I like the Sensitive Tummy Feeding Bottle. I like the soft tip infant feeding spoons and the heat sensing spoons. I like their sippy cups. I like the 360 Diaper disposal. I like the Closer to Nature Electric Bottle and Food Warmer. Thanks. I love the easy scoop bowls with lids. I like their breast pump just as much as I like their bottles. Such great products. I like their bottle warmer! I swear by their sippy cups! :) Thanks! Their new non spill cups. So many of the sippy cups spill all over the floor!!! I like using the tommee tippee bottle brush! Their pacifiers are one of the few that my son ever took! Love them! I like their sealer diaper disposal system too! I also like the electric sterilizer. Another item I like are their pop up storage cups. I like the easy scoop feeding bowls with lid and spoons! I love the Tommee Tipee Easi Roll Bibs. i like tomee tipee's glass bottle set and sterilizer. Precisely what is good with this Laura bottle milder is when involves a good indicator as well as a cold weather merge which often prevents the system coming from getting way too scorching.